These grilled zucchini rolls are the ultimate summertime appetizers or snacks. Fill them with hummus and roasted peppers for fantastic flavor! 43 calories and 1 Weight Watchers Freestyle SP. 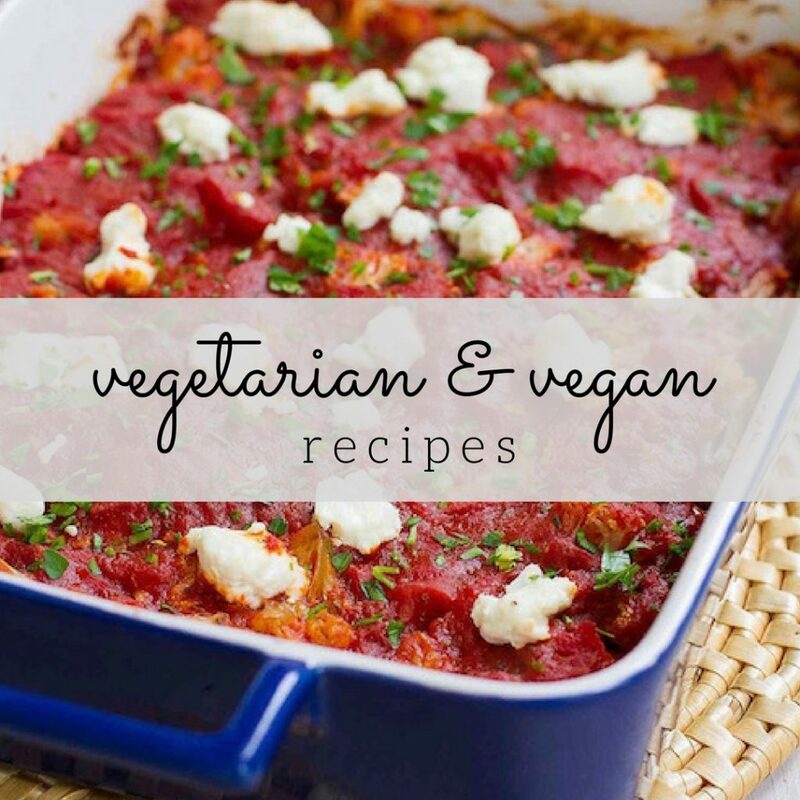 Thank you to Sabra for helping me to share this recipe with you. There was a massive vegetable grilling session at my house earlier this week. 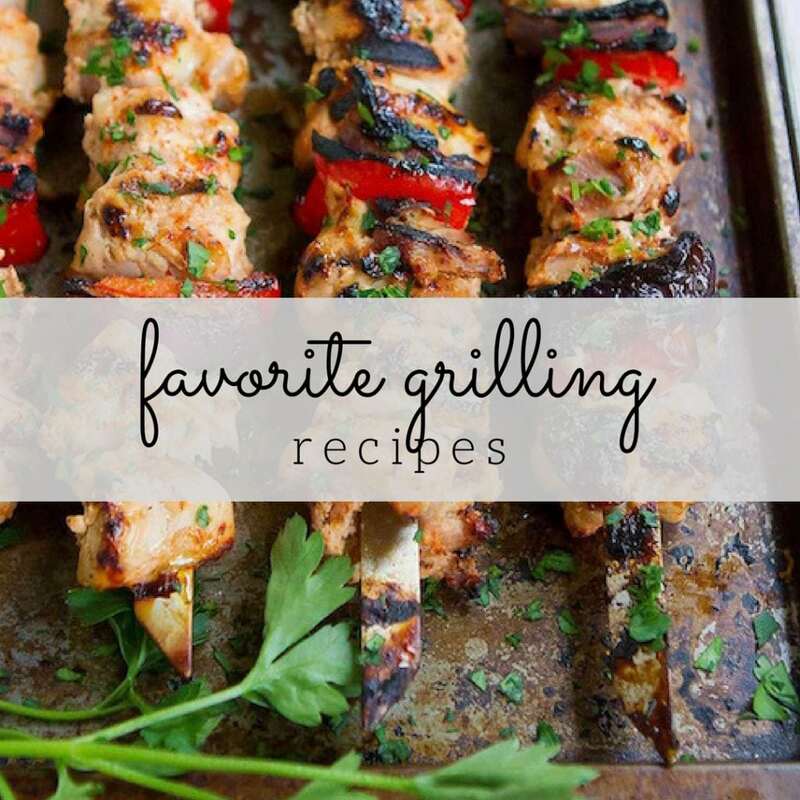 Peppers, eggplant, zucchini, mushrooms, yellow squash…you name, it took a turn on our grill. While the grilling en masse happened because I was making three recipes for the blog that all involved grilled veggies, it’s not an unusual thing to find me at the barbecue, cooking up side dishes to serve at dinner (be sure to check out How to: Grill Like a Girl…My Best Tips – including a “how to” for firing up a gas grill – if you yearn to be at the helm of your grill). The beauty of grilled vegetables is that they need nothing more than a little olive oil, salt and pepper, and mere minutes on a hot grill to achieve that smoky-sweet flavor. Today is officially National Hummus Day, though in this house everyday is Hummus Day. I can’t think of a day in the last two weeks that I haven’t eaten hummus in some form, whether it was an afternoon snack with raw veggies, an unofficial meal before dinner (this hummus combo was a hit) or combined with avocado in mini snack quesadillas. We always have plenty of Sabra Hummus on hand and, thanks to their huge variety of flavors, we never get tired of eating hummus. I am currently rotating between the Lemon Twist, Rosemary with Sea Salt and Tuscan Herb Garden flavors. 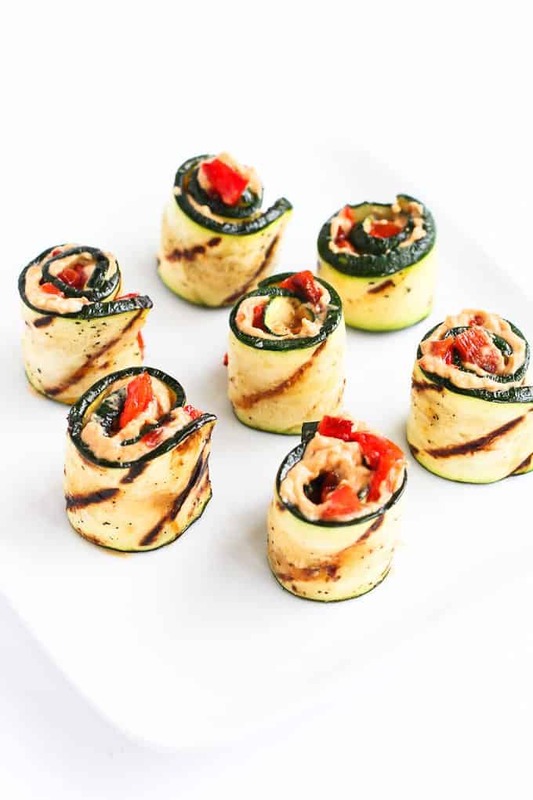 I did a little jump for joy when I tried the Tuscan Herb Garden Hummus because I knew it would be the perfect flavor for these easy zucchini roll-ups. This is not my first rodeo with zucchini roll-ups, but I’ve always filled them with some sort of goat cheese/vegetable spread. That version is spectacularly delicious but, admittedly, I am now partial to the hummus filled rolls. While my husband and I scarfed them down as a light lunch, they are the perfect candidates for our pre-dinner unofficial meals that we enjoy with our boys, with everyone gathered around the kitchen island while we prepare dinner. These zucchini rolls require very little work. Brush the zucchini strips with olive oil, season with a little salt and pepper, then cook on the grill for about 5 minutes, until the zucchini are pliable. 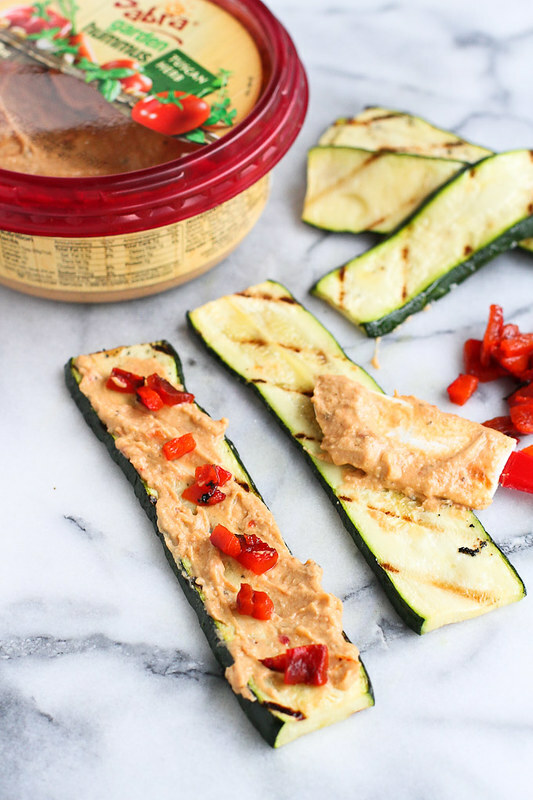 Spread some hummus on each piece of zucchini, top with some diced roasted red pepper (see How to: Roast a Bell Pepper), then roll up and serve. 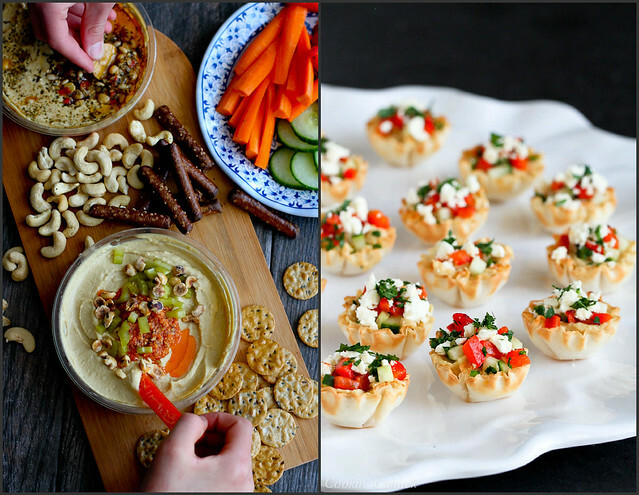 Easy, healthy snacks or appetizers! Slice a strip lengthwise from the zucchini to expose the inside of the vegetable. Discard or reserve for another use. Cut the 2 ends from the zucchini to make straight edges. Cut the zucchini lengthwise into ¼-inch strips (10 pieces). Brush both sides of the zucchini pieces with olive oil. Season with salt and pepper. Lay the zucchini pieces on the grill. Cook until the zucchini is very tender, but not mushy, 2 to 3 minutes per side. Remove the zucchini from the grill and set on a cutting board. Spread 2 teaspoons of hummus on each zucchini slice. Divide the red pepper evenly amongst the zucchini. Gently roll each piece of zucchini. Serve. Disclosure: This post was compensated as part of my ongoing ambassadorship with Sabra Dipping Co. All opinions are my own. Awesome! Those look and sound very tasty. PINNED! These are so fun! Perfect appetizer for any occasion!!! These are very colorful and look delicious. I love roasted peppers. What a great addition. Thanks for the recipes. 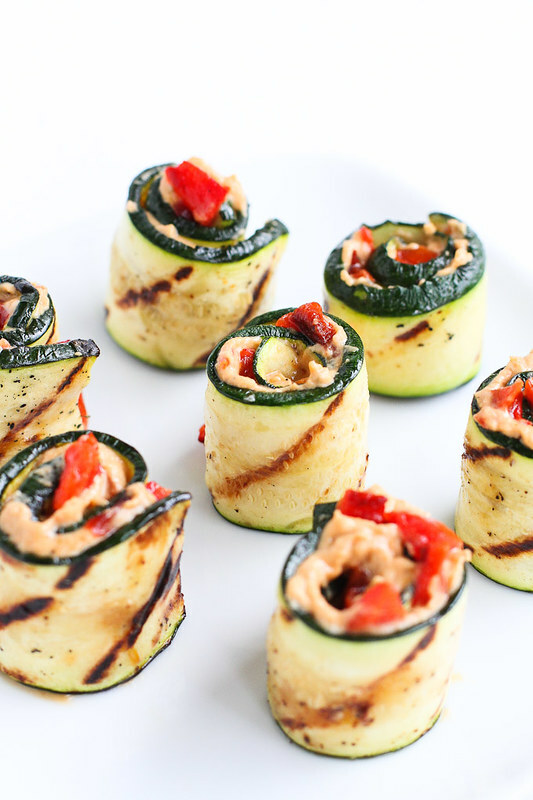 These zucchini roll-ups would be gone in a flash! Loving this idea! This is the perfect summer appetizer! These are really perfect for a summer party! I love the idea of using hummus in them. I’m all for taking these off your hands and leading them straight into my trap!! 😉 They are brilliant! What a great idea for an appetizer! My family would love these! These are absolutely delightful, Dara! I adore everything about this. These are perfect little bites! I am so glad that grilling season is upon us! And I have a whole fridge full of hummus – these are a must make Dara! These are genius! What a perfect summer appetizer! These are the perfect bites for summer. 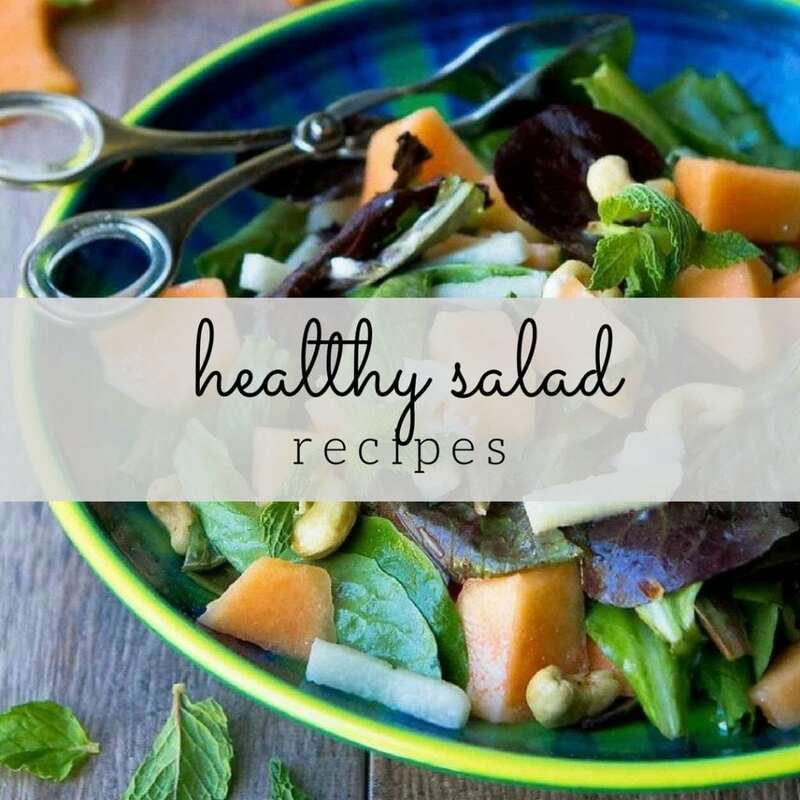 Love them as an app, but they’d make a great side dish too for a grilled summer dinner! These look fantastic. I’m guessing they would be perfect finger food with drinks. Just what I’m looking for. They look so good I’ll probably just eat them as I make them before they get to anyone else!